IN A COMPLICATED RUN-OUT year the model line-up of three- and five-door models are now only available with 1.4 and 1.8 petrol engines. The 2.0-litre i-VTEC petrol engine has been removed from the range as too has the 2.2 i-CDTi diesel. On-the-road prices start from �,640 for the 3-door 1.4 Type S and �,220 for the 5-door variant with the same size engine and specification. A new Si grade has been added to the final-year range but only for five-door models although it is available with both engines and offers manual and auto transmission options. A cosmetically sportier Ti special edition run of 500 units to support Honda's 2011 British Touring Car Championship campaign is also joining the line-up, again in five-door form with the option of both engine choices. Si versions are priced from �,240 with the 1.4-litre engine and have graphite coloured 16-inch alloy wheels while higher-powered 1.8 petrol Si Civics ride on 17-inchers. All Si variants have colour-coded bumpers, front fog lights, a Type R-style mesh front grille and dark chrome door handles and fuel cap  like that on the Championship White Type R.
Inside, Si models continue the sports theme with half-leather upholstery and also gain heated front seats plus a USB port for iPod connectivity. Honda says the Si has been designed to appeal to the Civic's increasingly youthful customers and those who want sporty looks with the practicality of a five-door bodyshell. In another bid to boost the Civic's run-out appeal, the limited edition Ti has race-car looks combined with high-spec interior equipment. Based on the five-door 1.4 and 1.8 i-VTEC SE variants, the Ti comes with �700 worth of extra equipment over and above the standard model includng a body styling kit and SatNav. Prices start at �,995 for the Ti 1.4 and �,995 for the 1.8 variant. Levels of specification in its run-out year are S, SE, Si, Ti, ES and EX GT and the 2011 Civic range tops out at �,220 for the five-door 1.8 EX GT. The most recent styling and specification updates include a new front grille (inspired by the iconic Type R model) which creates a smarter, more upmarket face. Other exterior changes include a range of new alloy wheels fitted as standard, with individual designs and sizes dependent on the variant chosen. The Civic, with its radical and edgy styling, wedge-shaped side profile, flared wheelarches with twin triangular exhausts and similarly shaped front fog lights, has been something of a success story in the retail and fleet sectors despite its 'like it or loathe it' initial reception. The wider view of motoring pundits was that that Honda was trying too hard to be different with Civic. The aim was, of course, to give the Honda brand youthful appeal by drawing in conquest younger customers in addition to retaining their older but young-at-heart followers who had traditionally bought previous models. Revisiting the Civic five-door range, I have just been trying the 1.8 i-VTEC Si version, arguably the best option for most buyers and fleet users. This model costs �,270 on-the-road but it is a buyer's market so it will pay to haggle on the price; there are also attractive finance offers to be had. The Civic sells in the segment dominated by the Ford Focus, Vauxhall Astra and the increasingly popular Volkswagen Golf, so it couldn't have tougher competition. Apart from the styling issues, the Civic isn't the roomiest family-sized hatchback for rear seat passengers and nobody seems to have a good word to say for the rear tailgate styling with its spoiler positioned halfway down the rear window, thus restricting visibility and not allowing for a rear wipe/wash unit. That said, the front interior is a pleasant enough environment; roomy and the twin cockpit-style dash layout is easy to use while the deep screen gives excellent forward vision. The 60:40 split rear seats fold down to extend the already large 485-litre boot and provide an even more useful 1,352-litre loadbay. 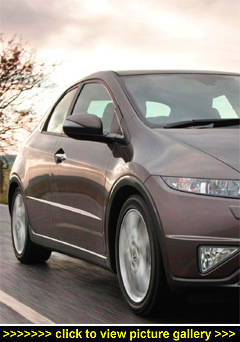 With its part-leather upholstery, the Si specification is a good combination of being sporty but not garish. The level of equipment is high with all the usual features including front and rear electrically-operated windows, electric door mirrors, air conditioning, heated front seats, a good sound system, push button starter, keyless entry and lots of digital instruments along with an on-board information system. The handling is very sharp and agile, and the steering really precise with good front-end cornering grip. However, the ride is very firm and the car feels unsettled at medium to high speeds. In these days of the �gallon of petrol a major reason to consider the 138bhp 1.8-litre engine is its combination of performance with its ability to be frugal on fuel. Top speed is 127mph and the zero to 62mph acceleration time is just 8.9 seconds. Impressive, but even better is the fact that driven in a sensible manner  using the green light eco 'prompts' for gear changes  my test Civic returned no less than 50.2mpg over 260 miles using the M4 and M25 motorways at legal speeds and keeping up with the rest of the traffic and not dawdling along at a snail's pace. That just goes to show what can be achieved by the latest petrol engine technology and makes costly hybrids look less appealing. Overall, the Civic 1.8 finished up returning an average 47.4mpg once I had covered some A and B roads and a few trips into my local town. All the more remarkable when you consider the official average fuel economy quoted by Honda is 5mpg less, at 42.2mpg. With CO2 emissions of 155g/km, the VED road tax cost is �5 a year and company car drivers will pay 20% Benefit-in-Kind tax. There are not too many uniquely styled mainstream family-size cars on sale today but the Honda Civic is one of them. It isn't without its faults, namely cramped rear passenger leg and headroom, a firm and unsettled ride and 'love or hate' styling. But it is very well made, built in Britain and it can be miserly with fuel as well as offering good value for money. It also handles well and has a usefully large boot.